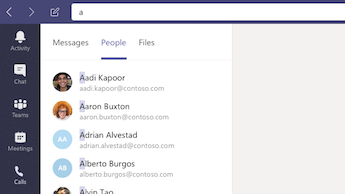 You'll find a lot of familiar features as you make the switch from Skype for Business to Microsoft Teams—plus a few new things we hope you'll like! Here's a short breakdown of the similarities and differences between Skype for Business and Teams. Teams and channels for tracking projects, conversations, files, and meetings all in one place. @mentions to get someone's attention. An IM in Skype for Business is called a chat in Teams. 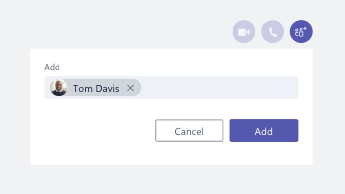 In Teams, you can add flavor with emoji, GIFs, and memes and even convert a chat into an audio or video call! In addition, Teams offers persistent chat, so you can find and resume any conversation. Go to the command box at the top of the app. Type the name of the person you want to find. Select the name from the list. At the bottom of the screen, compose your chat message and press Enter. From the chat, click Add people . Type the names of the people you want to add, and then click Add. Go to the compose box at the bottom of your chat or channel conversation. Click Emoji to select the perfect face from the gallery. Click GIF to search for an animated GIF. Click Sticker to go to our galleries of customizable memes and stickers. 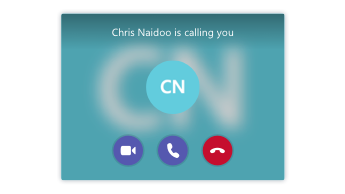 From your existing chat, click Video call or Audio call at the top of the screen. In Teams, you can find and resume a previous conversation. No matter how many times you've spoken to that person, it's all in one place. To search for old messages (or people, chats, and files), use the command box at the top of your screen. Click the conversation you want to continue. Click Chat on the left side of the app. Your active chats are highlighted in bold. Want to learn more about chat? Visit the Microsoft Teams help center. 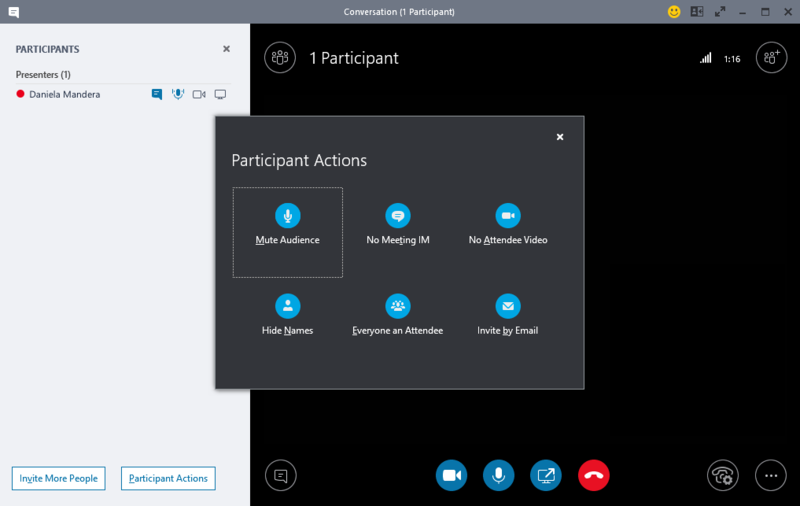 Like Skype for Business, you can schedule and host online meetings in Teams, as well as manage chat and people from your meeting window. Even better, meetings are part of your Teams interface, keeping all contacts, conversations, calls, and meetings in one place. Open Outlook and go to the calendar view. Click New Teams Meeting at the top of your view. 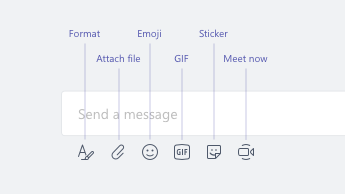 Invite people, add meeting details, and click Send. People outside your organization can use a guest account or join the meeting anonymously. From your Outlook calendar or from an Outlook reminder that pops up. 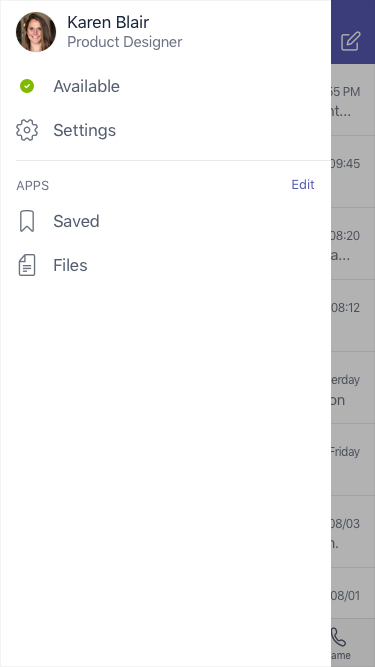 In Teams, click Meetings on the left side of the app. Find the meeting and click Join. After you click Join in Teams, you can choose how you get audio. Teams automatically tries to connect to your computer headset or speakers. Alternatively, you can dial in using the phone number (if provided in the meeting invite). 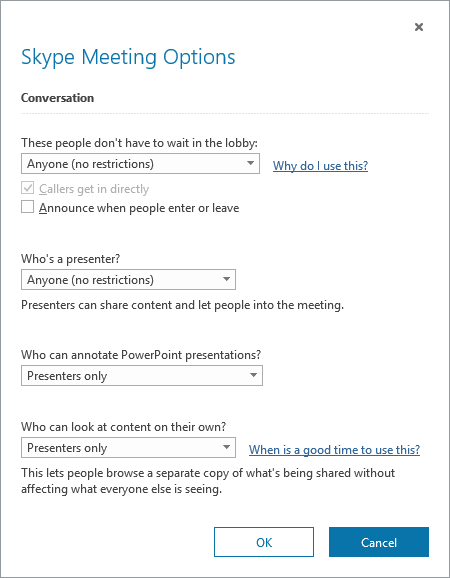 To share your screen, a specific app, or a file in a meeting, click Share desktop in your meeting controls. While sharing, click Give Control at the top of the screen to hand the reins over to someone else. Click Cancel Control to take them back. 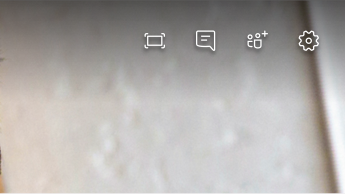 While sharing, your meeting window remains visible in the lower right corner of your screen. You can move the window, but not close it. Click Show conversation to chat with people during a meeting. Click Show participants pane to see the roster, where you can add, remove, or mute people. 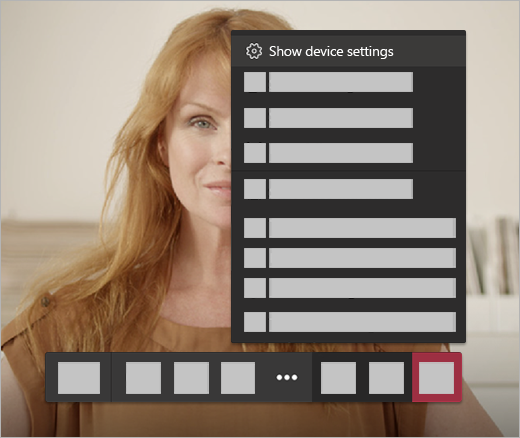 Click Show choose devices pane to select your speaker, microphone, and camera options. Still curious about meetings? Visit the Microsoft Teams help center. 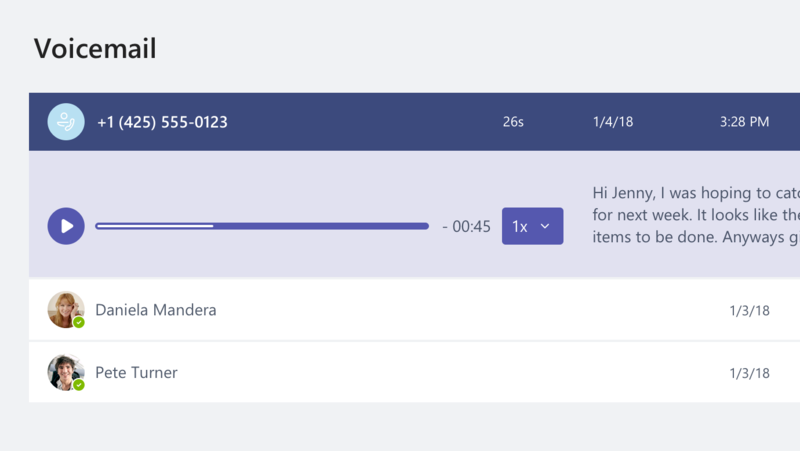 Just like Skype for Business, Teams can also serve as your office phone. From one-click speed dialing to a standard dial pad to accessing voicemail, Teams offers all of your calling needs at your fingertips. Go to the command box at the top of the app and type someone's name. Select the person to start a chat. At the top of the chat, click Video call or Audio call . Click Calls on the left side of the app. From the person's profile card, click Video call or Call . Enter the person's number on the dial pad. 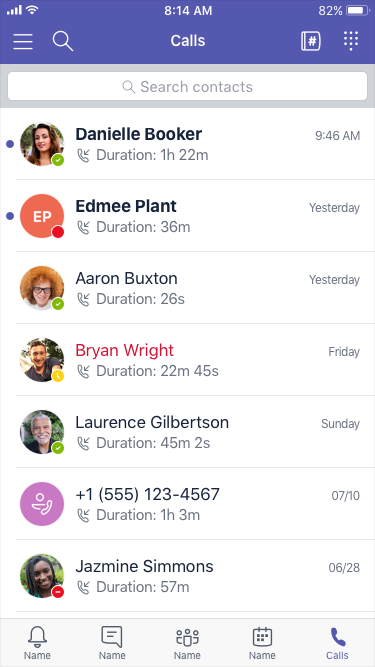 For right now, this feature only works for calls that start as group calls. Click Add people in the top right corner of your screen. Type a person's name in the box at the top of your call roster. In a call, click Choose devices at the top right. Use the menus to select the speaker, microphone, and camera options you want. Click your profile picture at the top of the app. Under Call answering rules, choose Calls don't ring me. Select where you want your forwarded calls to go. Whenever you get a call in Teams, you'll receive a notification. Click Accept video call to enable video. Click Accept audio call to answer with audio only. Click Decline call to go on with your day. Select a voicemail from the list. Use the playback controls to listen or read the transcript. Got more questions about calls? Visit the Microsoft Teams help center. Try Teams on the go! Sign in to Teams on your mobile device to chat, call, join meetings, and more, wherever you are. Download the mobile app. Tap More at the top of the screen. Tap your status to change it. This updates your status on all your devices that run Teams, including your computer. Tap Settings to change your profile options. Tap New chat at the top of the screen. Type a name or names in the To field. Type your message and tap Send . To turn your chat into a call, tap Video call or Audio call at the top of the screen. 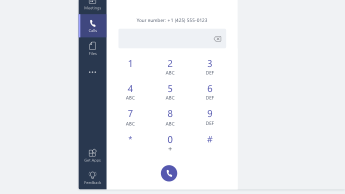 To call someone directly, tap Calls > Dial pad and enter a phone number in the dial pad. To call a contact, tap Calls > Contacts and select a contact. When a call comes in to Teams, a notification pops up, letting you know. Tap Answer (the blue one!) to start talking. Tap Meetings to go to your calendar. Find the meeting and tap Join. Tap Join from a meeting notice in a channel or chat. Want to learn more about using Teams on your mobile device? Visit the Microsoft Teams help center. When I try to sign in to Skype for Business, I see a message saying that Skype for Business has been upgraded to Microsoft Teams. What does this mean? 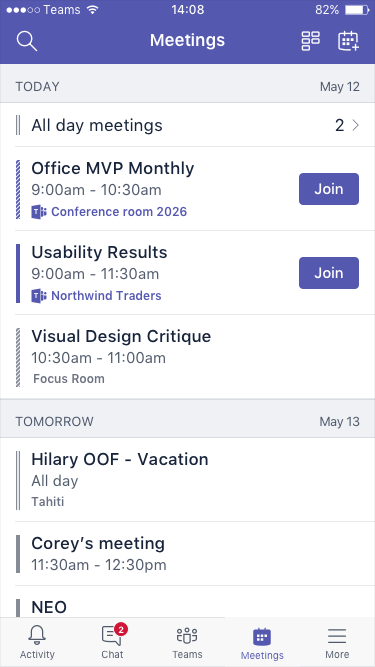 Your organization has upgraded to Microsoft Teams. 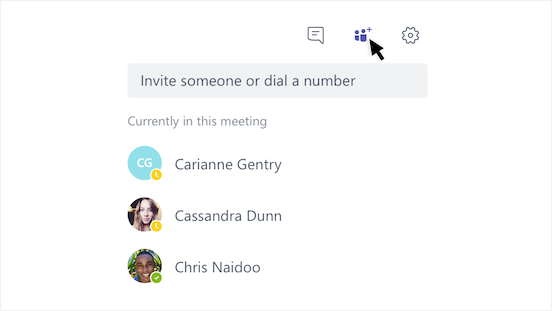 While you'll still be able to edit, cancel, or join existing Skype for Business meetings, you won’t be able to use Skype for Business to chat, make calls, or create new meetings. 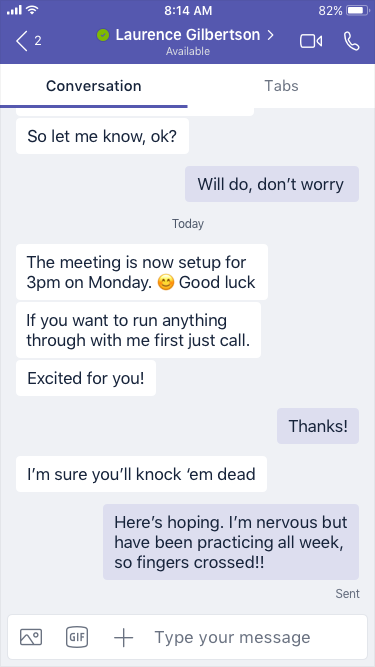 Teams has many of the same meetings, calling, and chat capabilities that you’re used to. Look on the Chat (IM), Meetings, and Calls tabs in this article to get familiar with how to do these things in Teams. For questions around the upgrade itself, contact your help desk or refer any to resources that your organization provided. What happens to my existing Skype for Business meetings? Skype for Business meetings that were scheduled before the upgrade are still in your Outlook calendar and will be hosted in Skype for Business. Online meetings that you create once your organization has upgraded will be hosted in Teams. In both cases, join the meeting by clicking the link in the Outlook meeting invite and following the prompts. How do I change options for an existing Skype for Business meeting? 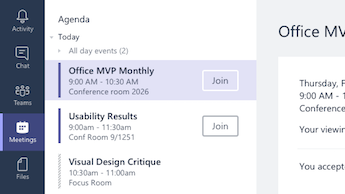 Before the scheduled start time, open the meeting from your Outlook calendar and click the link to join. To change options for participants, click Open Participant Pane > Participant Actions. 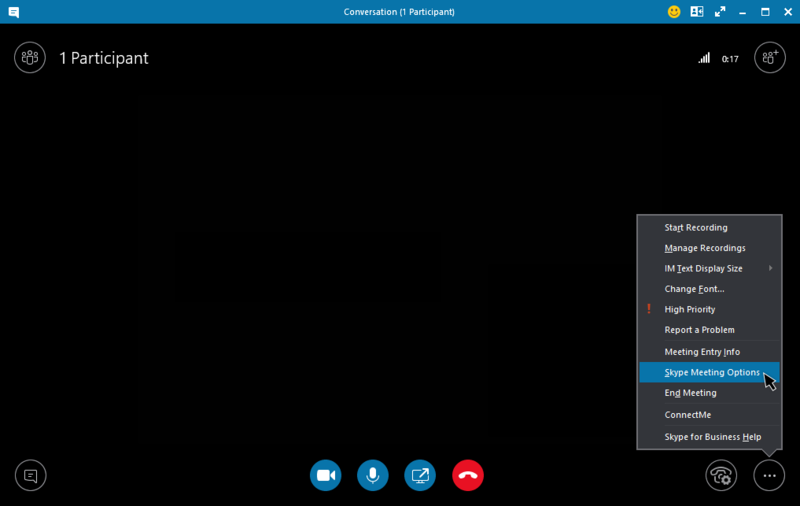 Note: To change an existing Skype for Business meeting into a Teams meeting, you’ll need to set the meeting up again. For info, see Set up a meeting. To change audio and video devices used during the meeting, click Call Controls > Devices. Where do I find my past Skype for Business conversations, calls, or voicemails? You’ll be able to find these if your organization had the Conversation History feature enabled in Skype for Business. The easiest way to find them is to open Outlook, then go to the Conversation History folder. Are my Skype for Business contacts and contact groups in Teams? Yes. In Teams, click Chat on the left. You’ll see two tabs at the top—Recent and Contacts. Your Skype for Business contacts and contact groups are on the Contacts tab. Click More options next to a contact or contact group to see what you can do. Where can I learn more about how to use Teams? There are a couple of ways. The Teams help center has training courses and lots of how-to info. When you’re in Teams, you can click your profile pic, then Help, to see similar how-to info and chat with our bot.